Home creative passion creative process inner critic Creativity and the Cosmic Egg! The Fiction Writer's Imagination Is Limitless. 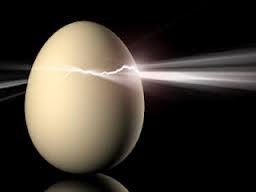 Creativity and the Cosmic Egg! The Fiction Writer's Imagination Is Limitless. as a great huge egg. Maybe your egg is as big as a house but your Inner Critic wants you to believe it’s very small, most likely a passageway of two inches by twenty inches and in this small space are the subjects that the Inner Critic deems “safe” and “appropriate” for you to write about. So, you are constantly writing within that very narrow parameter. Challenge your Inner Critic and everything grows bigger! As you start to challenge your Inner Critic, start to write out of your true voice, that area opens and grows bigger and bigger. Everything expands. This magical brew that is your creative unconscious begins to send up these very exciting images and story lines and characters that take you to new places. When you write from a passionate core, when you are writing from your true voice, your writing naturally gets better. I’ve never seen it fail; the writing naturally gets better.